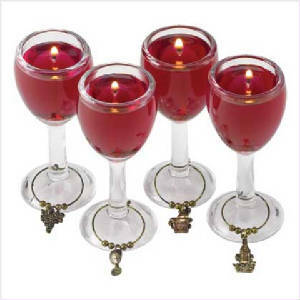 Surprise and delight the wine lover on your list with this clever candle set! Gourmet-themed trio looks just like a banquet of tempting treats; lush green grapes, a creamy wedge of cheese, and— best of all— a bottle of fine vintage! 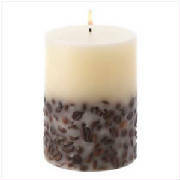 All three candles are deliciously scented with mouthwatering Merlot fragrance. Sure to be the "light" of the next party! 90% paraffin wax; 10% palm oil. 5 3/4" x 3 7/8" x 10" high. Sweet vanilla and French Roast coffee are a café favorite; our classic candle brings the scrumptious scent of a boutique coffeehouse right into your home! 60 hours burn time. Weight 0.7 lb. Paraffin wax with coffee beans. 3" diameter x 4" high.